Autumn leaves start out beautiful, but eventually, they become just a mess on the lawn. Fall clean-up of leaves is not a chore most gardeners look forward to. Some gardeners wonder if it is even necessary to rake leaves. Won't the leaves just compost naturally on the lawn? Yes, they will. If you only have a few leaves, you may be better off letting them blow off into the bushes, turning into mulch and fertilizer. Or you might want to run the lawn mower over them and let them feed the lawn. But if you have substantial leaves, so many that you can't see the lawn underneath, the leaves will smother and kill the grass long before they turn into fertilizer. If that is the case, one way or another, you are going to have to collect the leaves from your lawn, and there really aren't that many options. Attach a Bagging System to your Lawn Mower. This is especially nice with lawn tractors. If you have a large property, mature trees or a bad back, a leaf bagger will make your life much easier. 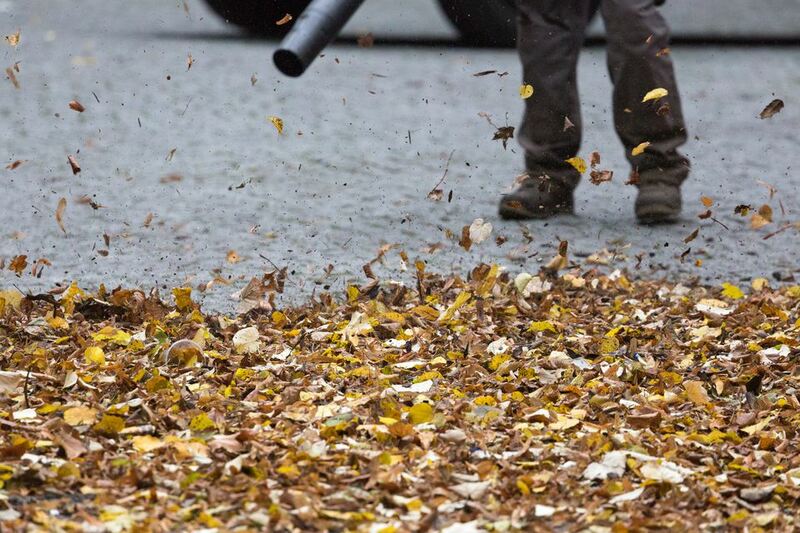 As with most mechanical leaf cleanup, the leaves will need to be dry, or you will clog the mower and the bagger. Use a Hand Held Leaf Blower/Vacuum. These are very popular in suburbia, but they are loud, heavy and a bit smelly. In their favor, blower/vacs do a nice job of shredding dry leaves, and they make quick work of clearing driveways and sidewalks. However, don't waste your time trying to use one on wet leaves. Raking. It's not glamorous, and there's certainly no cup holder, but it is efficient, and there are few feelings of such total satisfaction as when you've finished raking your yard. Today there are many more options when choosing a lawn rake. Ergonomic rakes, the type with the bent handle, are much easier on the back, once you learn to let the rake do the work. Foam-cushioned handles help prevent blisters and wrist and hand injuries. Wider rakes cut down on actually raking time. Expanding rakes allow you to use the widest bow to rack the lawn and narrow the bow when you need to get between bushes or structures. They've even developed 'clog-free' rakes! Whatever method of leaf clean-up you choose, don't push the leaves to the curb for pick-up. Think of fall leaves as garden gold. Leaf mold, or semi-rotting leaves, is high in nutrients and adds substantial organic matter to your soil. You can create leaf mold very easily by simply piling all your leaves and letting them sit for a year or so. The bottom of the pile will begin decomposing first and can be used as a soil amendment or mulch. Shredded leaves can also be used as a mulch. The leaves must be dry to shred, but moisten them immediately after mulching, or the wind will carry them all back onto your lawn. Don't use unshredded leaves. Unshredded leaves will mat together and form a dense layer that won't allow water to pass through. Both shredded and unshredded leaves can be used as the 'brown' component in your active compost pile. As we mentioned above, dry leaves piled alone will eventually decompose into leaf mold, which is a type of compost. But combining dry leaves with green garden waste will result in an actively decomposing pile and will speed the process. To help you find the perfect leaf raking tool, take a look at Top Picks for Leaf Blowers, Vacuums & Rakes.